After finishing in fourth place in the Summoner’s Inn League earlier this month, we took some time off to review our game plan and how we will approach the next season. After a few weeks of deliberation and weighing our options, we have decided to make changes to our active League of Legends line-up as we move forward. It’s with a heavy heart we announce that we are parting ways with Floris “Vamir” Tuijn, Nils “Hammann” Hammann, Brayan “Kruimel” Van Oosten, and Nick “Crane” Turberville. In an effort to bring more proficiency into our coaching, and to build a more cohesive team, we have started looking at new prospects who fit into our system and can elevate our play to a new level for the next split. As such, we are thrilled to introduce our two new players, who will be joining our roster effective immediately! Joining us as our new midlaner will be Janik “Jenax” Bartels. Previously playing for mousesports, Jenax will provide us with a strong mid presence, as well as experienced leadership, as he will take up the shot-calling responsibilities as well. On the bot lane, we will be fortified by Richard “Nightmares” Gielisse, who will be our new support player. Alongside Tobias “Navio” Stephan, they will form a duo which will give nightmares to all the opponents they will face. The additions we have made to our team are going to help us a lot in improving our current skill level. Last split we didn’t really get further than how good we were at the start, but now with more confidence and the changes to our roster I believe we have a good shot at beating every team in the league. On paper they might look stronger than us, but I’m confident that we will improve our standing throughout the split. 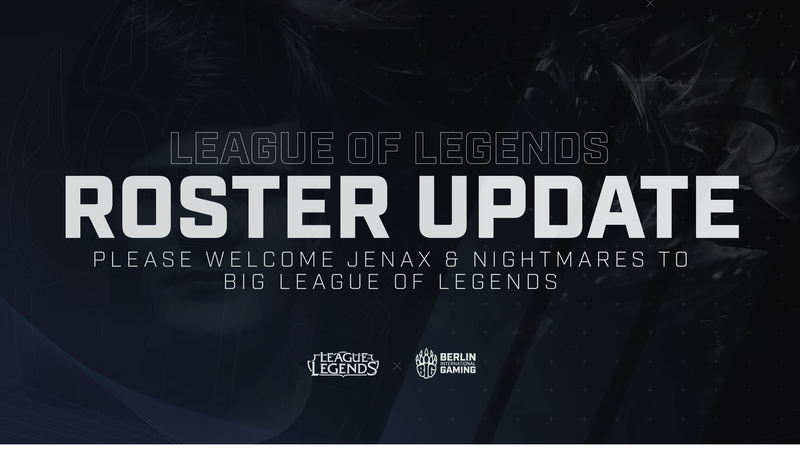 The addition of Jenax will help Don Arts in decision-making and shotcalling during the games, while Nightmares will help Navio to have a better laning phase. Both new players are experienced enough to work with us on our mistakes and improve our gameplan and teamplay. I’m pretty sure we’ll see a better BIG next season, even if our last season was totally fine, but not really satisfying overall for the players. I also want to thank Kruimel, Hammann, Crane and Vamir for all their effort and wish them best of luck for their new chapters. I’m looking forward to meet the team next weekend in our bootcamp! I am really excited to join such a professional and successful organisation like BIG. I believe that we can achieve great things with our lineup, and I am looking forward to dominate the German scene! I have always wanted to take competition more seriously, and now with BIG, I have the perfect opportunity to put myself to the test! Our new line-up will play their first match on the 3rd of October in the ESL Meisterschaft! Make sure to tune in, and show your support for the new members of the BIG family!